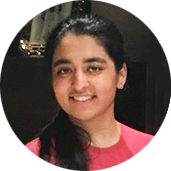 "I expected to score more than 95 per cent, but 99 is a pleasant surprise," said Isha, who wants to become a computer engineer and is currently preparing for JEE. "Class 10 was like any other year and I am happy that I could pull it off so well," she added. 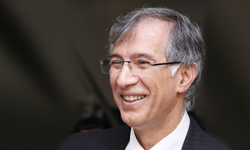 Welcome to Hiranandani Foundation School News & Events page. 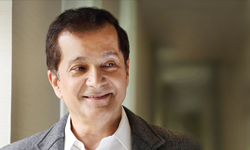 We hope you will keep visiting this page regularly to update on what is happening at Hiranandani Foundation School. 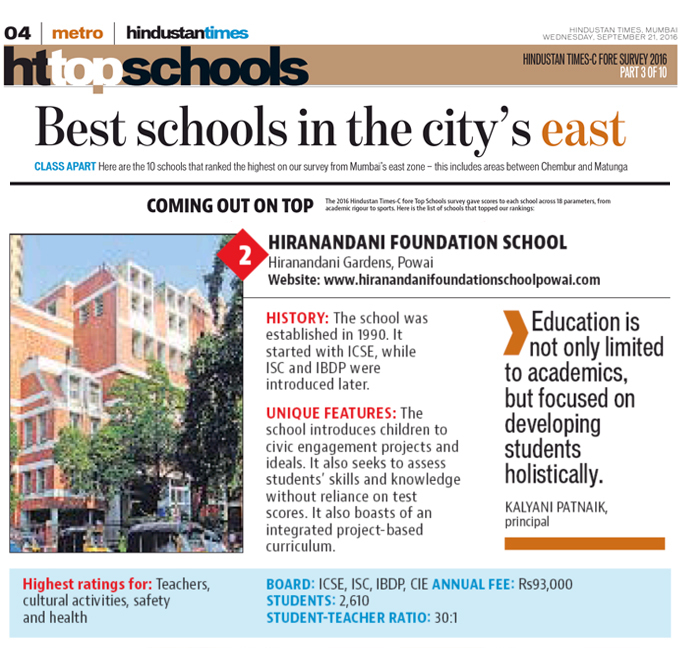 Hiranandani Foundation School Powai Ranks 6th in Mumbai and 7 th in Maharashtra. 1. HFS Ranks 5th in the list of Mumbai Top Ten schools and Ranks 6th in Maharashtra . 2. HFS is Ranked No .8 among-st India's Top Ten Library and Reading Culture schools in India . 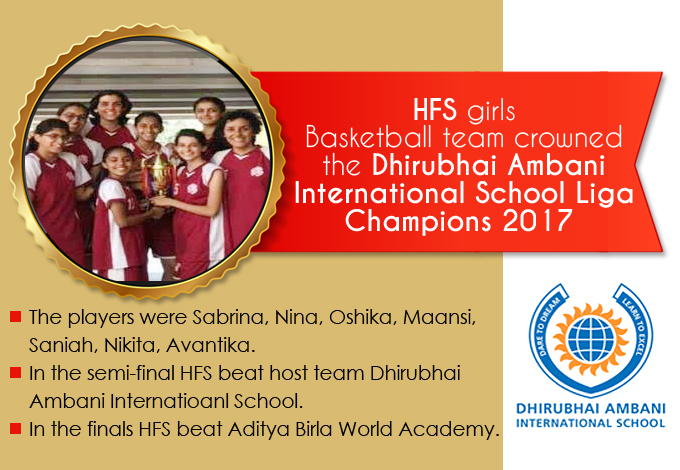 HFS girls Basketball team crowned the Dhirubai Ambani International School Liga Champions 2017. Congrats Team ! Keep it up. The players were: Sabrina, Nina, Oshika, Maansi, Saniah, Nikita, Sakshi, Avantika. In the semi-final, HFS beat host team Dhirubai Ambani International School. In the finals, HFS beat Aditya Birla World Academy. 1. MSSA under 12 football team qualifies for the finals. 2. Advait Sangle receives Post Graduate Degree in abacus on Sunday at the convocation ceremony at Mumbai University on 12th February, 2017. Congratulations childrens !!! - Principal, Mrs. Kalyani Patnaik. International Young Mathematics Convention-2016. @ C.M.S., Lucknow. Congratulation to the participants of International Young Mathematics Convention-2016. @ C.M.S., Lucknow. Team activity: Silver medal - Kaustub Anand, Anusha Krishnan, Tanmay Kotian. Individual event: Bronze medal - Kaustub Anand, Anusha Krishnan. 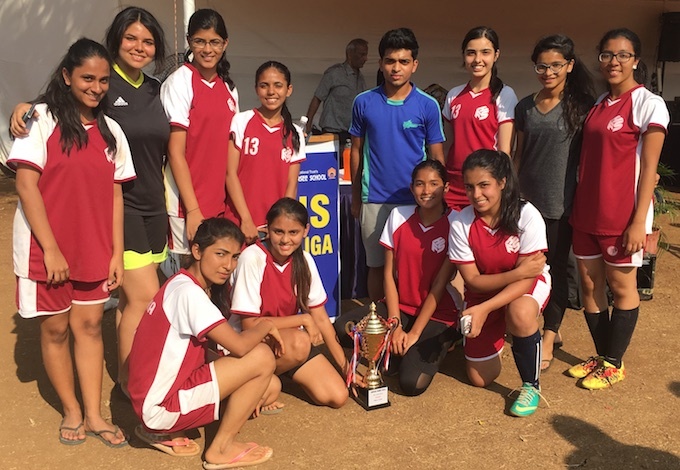 ISC Girls bag the JNS LIGA Trophy 2016. Keep it up!!!! Hiranandani Foundation School - International ISC girls won the JNS LIGA Trophy for the year 2016. Congrats Team ! Keep it up. Hindustan Times commissioned research organisation C fore to conduct the survey to rank top Schools in Mumbai. C fore researchers visited each school shortlisted for ranking based on the objective and perceptual data collected. The data gathered was also audited by talking to parents and students. 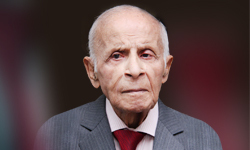 Out of 133 students, 102 students scored above 90% marks, and all students scored first class. 100% success, all got first class, 90% distinction.